HPS 100% Stainless Steel T-Bolt Clamp with Floating Bridge 8.25"-8.56" (210mm-218mm) for 8" inch ID hose provides leak-proof connections in a wide variety of industrial, commercial, and military applications. HPS manufacture our clamps from 300 series stainless steel with rounded band edges to protect soft hose materials. 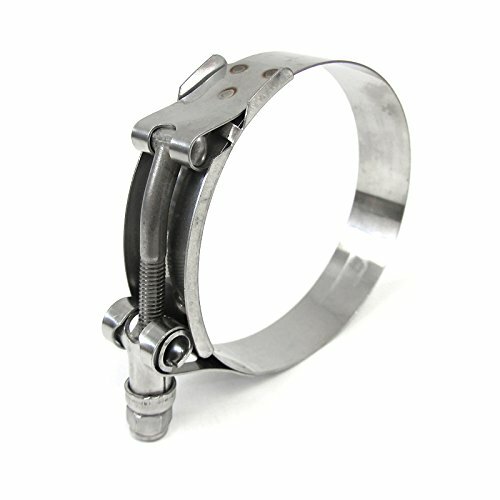 HPS Stainless Steel T-Bolt Band Clamps provide high tensile strength, durability, and corrosion resistance. HPS Stainless Steel T Bolt Clamps are the perfect choice for medium and heavy-duty applications. HPS Stainless Steel T-Bolt Band Clamps are frequently installed on Coolant and Air-Intake Systems for Construction Vehicle, Truck, Aircraft, Marine and Bus Engines, Duct Systems, Baghouse Equipment, Irrigation Systems, Medical Equipment and Precleaners. Technical Specification: SAE #236. Effective Size Range: 8.25"-8.56" (210mm-218mm). 100% Stainless Steel Band, Bolt and Nut. Floating bridge and rolled edges to protect soft hoses. Superior welded construction. Meets or exceeds SAE Spec. J1508 for T-Bolt clamps. 3/4" Band Width. Max. Torque Spec 75 in. lbs. Quantity: 1.